We were given a list of made up company names. We had to choose one to do the project on. • DIGITEC: An Educational establishment specialising in digital technologies. • An ‘own choice’ company (for instance if you know of a company requiring a new identityyou can liaise with your tutor/s re it’s suitability as the context for this module). I thought about doing Gigstar because I play guitar so I thought it would be a good topic for me to do. 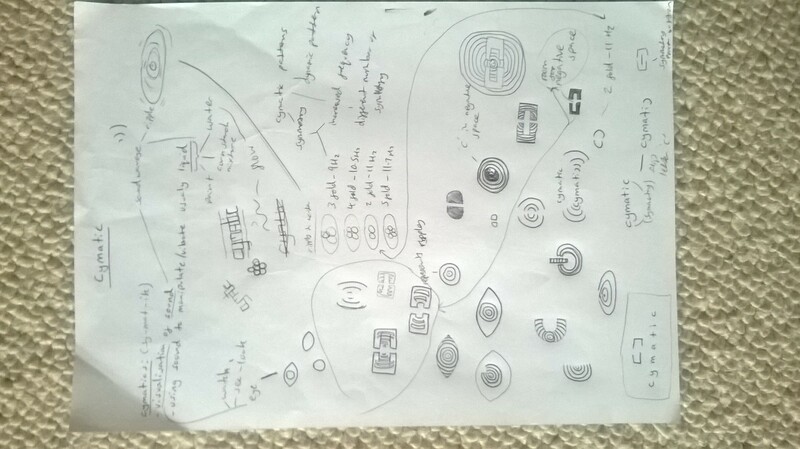 I also had some good ideas for Cymatic. 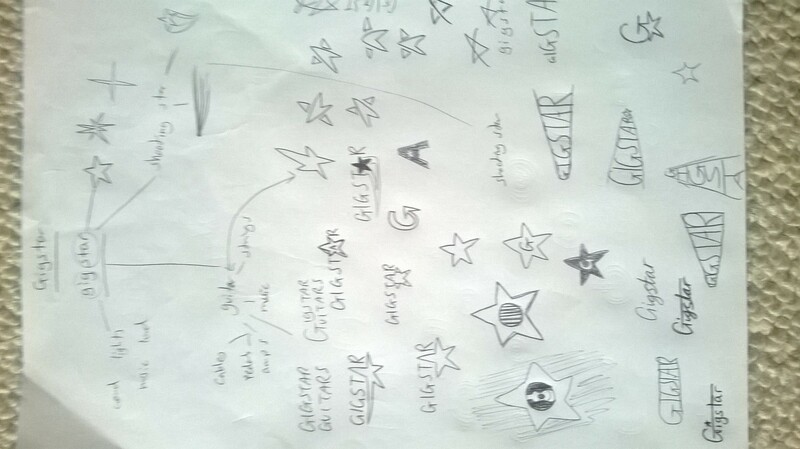 – The original idea I had was the top point of a star would make the A in Gigstar. – I then sketched the A as a star. – Then I tried a star in a shape of a guitar (all be it vague). – A circle in a star. Negative space making a guitar or lines resembling guitar strings. – Just Gigstar in a signature style (like Gibson/Fender). I researched what Cymatics, and found out it is the visualization of sound, mainly using water/liquid. – My initial idea was an eye with a ripple or circles for the pupil. – A C shape mirrored resembling sound waves/ripples. Also the C at the start and end of Cymatic. (Could have negative space design). – Just the word Cymatic in a flowing font. 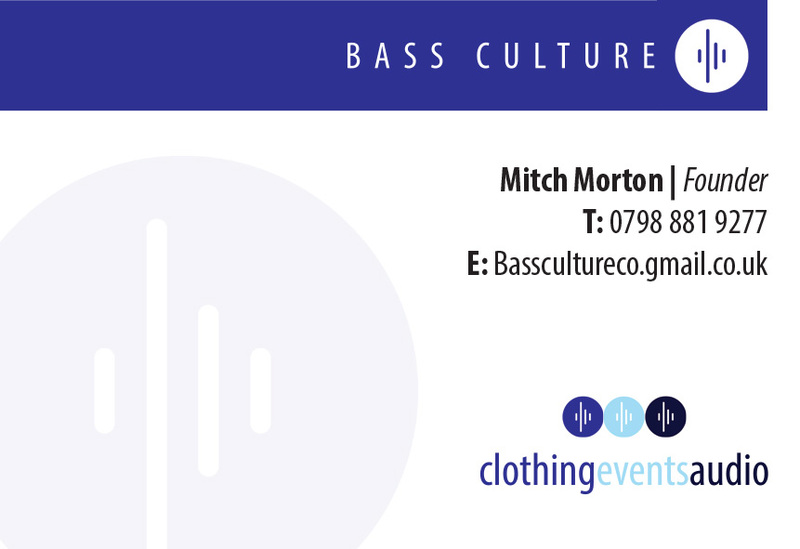 Around the time we started this project, one of my friends friends (Mitch, who is a DJ) wanted to start a business that sells clothing, audio and music events called Bass Culture. He wanted me to make some T-shirt designs, but he didn’t have a logo, so I said I would do it for him and use it for my project. I met up with Mitch and we had a discussion about logo ideas. 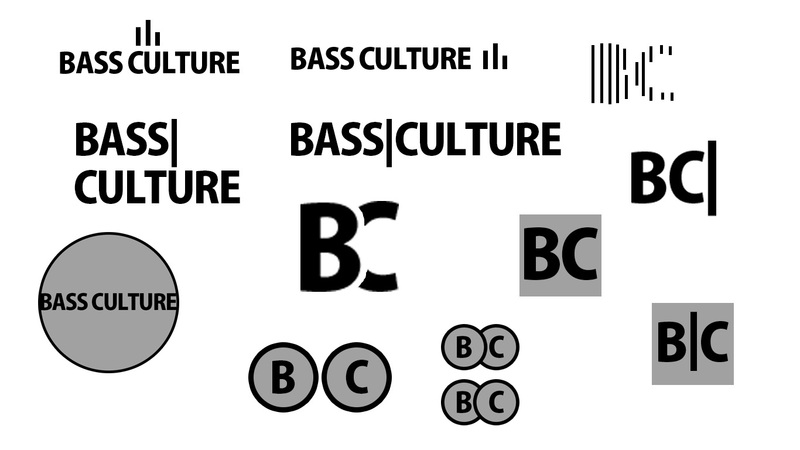 To get some ideas we looked at what was associated with bass/techno music. We realized that circles occurred a lot (headphones, vinyl disks, turntables, speakers etc). Also he liked the idea of using equalizers/wave forms. 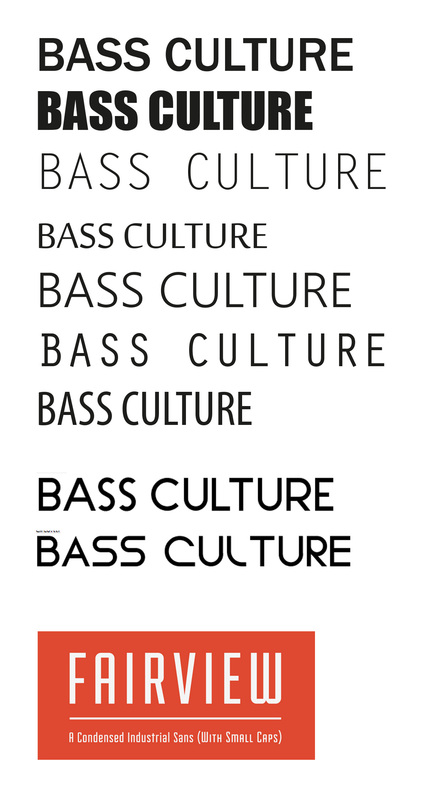 – Bass Culture in a circle. (B C in separate circles). 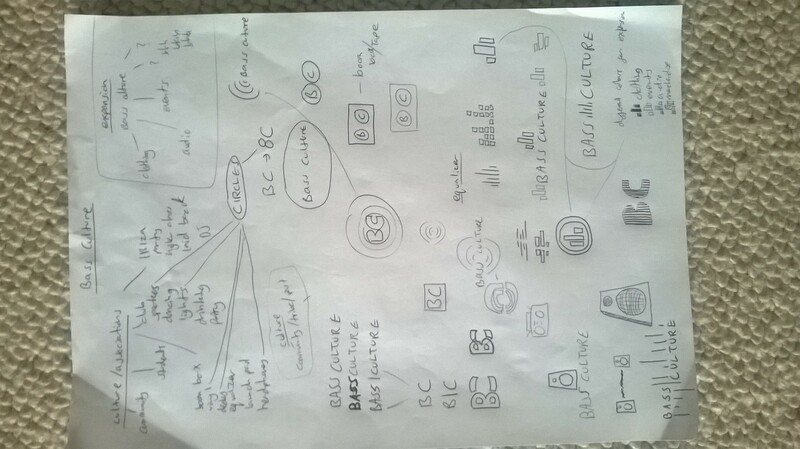 This is a quick art board we did just to get an idea of what some of the logo’s we sketched would look like. We decided on the equalizer/wave form idea so I refined that idea. We liked the ideas with the text but we felt it was too complex for a logo. So we went with the designs towards the top left of the image (particularly the one in a circle. After a bit of research, I realiseed that it resembled the Allianz logo. So I told Mitch and I did another art board to experiment more with the logo. 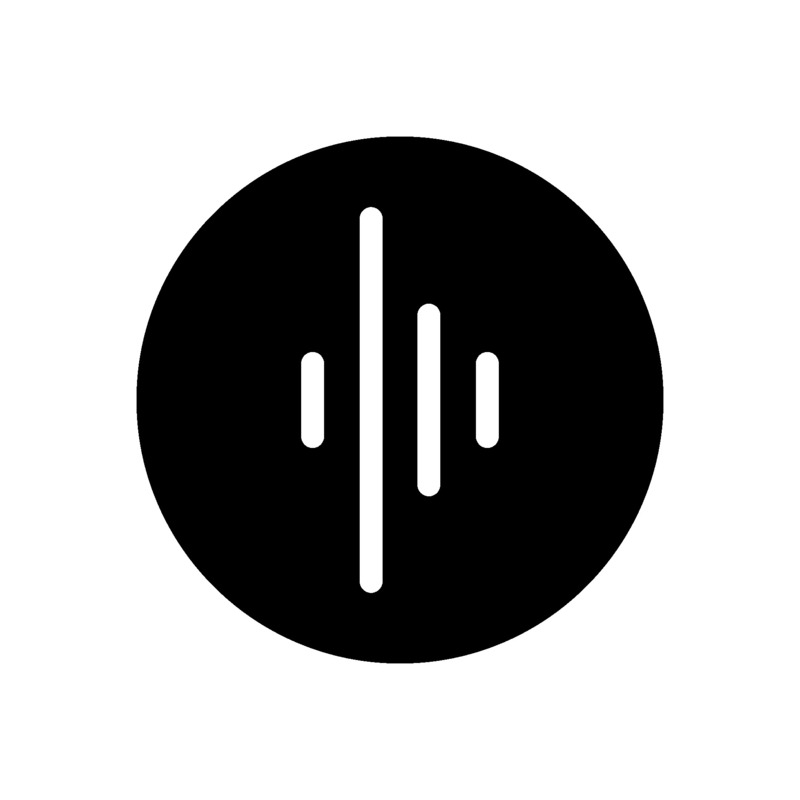 I looked at images of graphic equalizers and wave forms and incorporated that into the logo. Below is the design we went for. 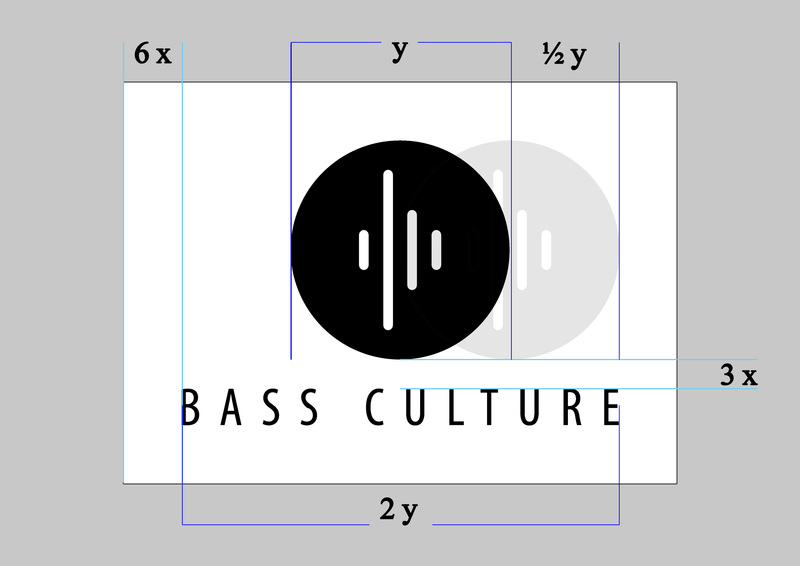 The logo is a circular shape because there are many thing associated with bass music that involve circular shapes (speakers, vinyl, headphones etc.). The lines represent waveforms/graphic equalizers which are more up to date, as opposed to records and vinyls. The shape of the lines subtly resembles a ‘play’ button symbol, but the use of the left most line helps break away from it actually being just a ‘play’ symbol made up of lines. I made a list of fonts that I thought would suit the logo. I also looked on Dafont and other websites for a good typeface. We originally wanted a bolder typeface but after arranging the text with the symbol, a condensed font worked well with the lines in the circle. 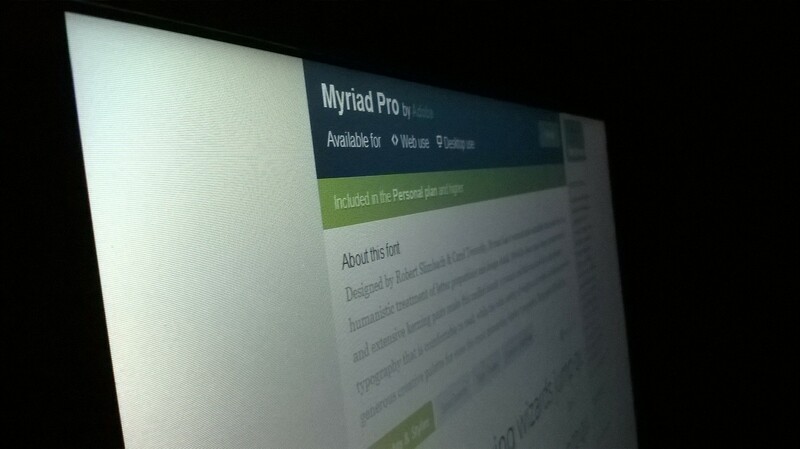 I chose Myriad Pro Condensed. 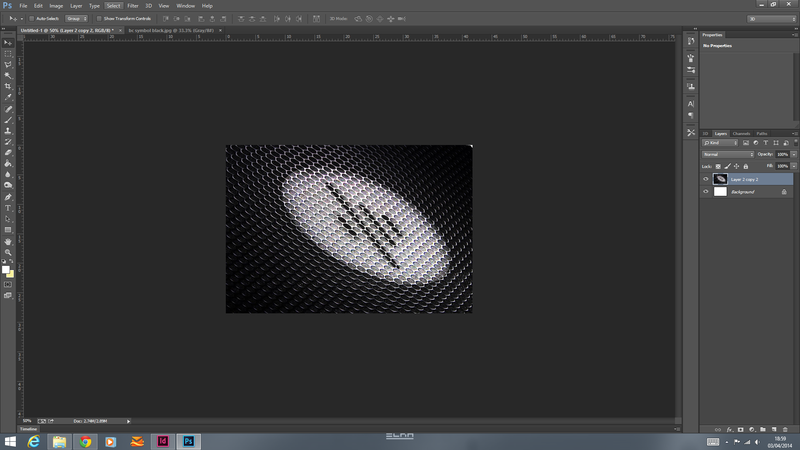 I must say that this logo alteration came about when I was coming up with business card ideas. Which I will explain later. I just put it here to keep it with the others. After going through colours, we decided on blue. 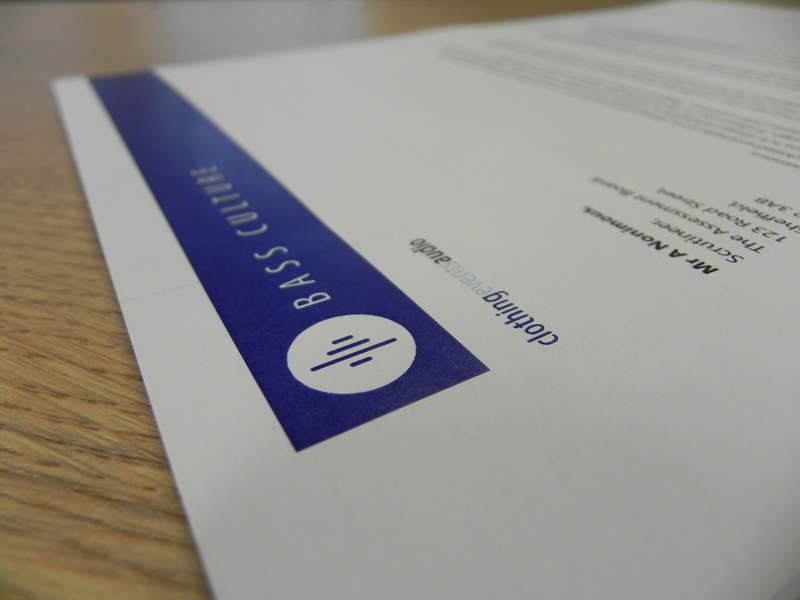 We thought blue represented bass/techno/house music well. Also, blue can symbolize trust and wisdom. It is also an atmospheric colour. Below are the black and white versions I sent to Mitch, also a few different shades of blue for him to pick. These are the colours that I chose. 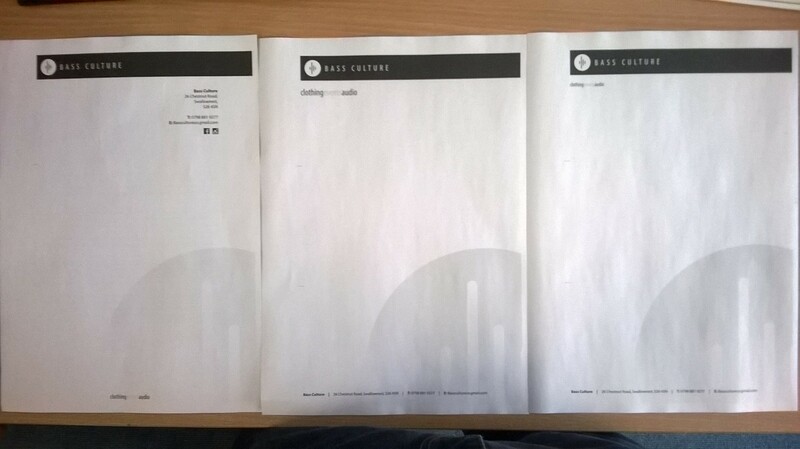 Once I had the logo, I made my corporate stationary. 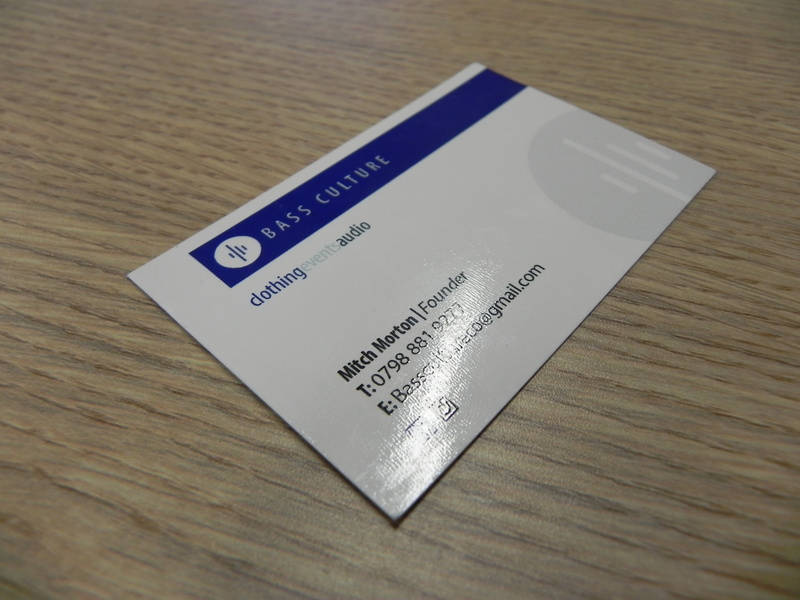 I started with the business card. We thought it was best to go with a simplistic design that would compliment the logo. So I came up with a few different ideas. One idea was to have the information on the back and the logo on the front with a drop shadow, but I was told that I would have to consider when it is printed out it will be smaller than on screen and the detail won’t look as good once it’s printed. There wasn’t a lot of information anyway and it all fit on one side without being cluttered, so I suggested we stick to one sided design. I showed Mitch the designs below. 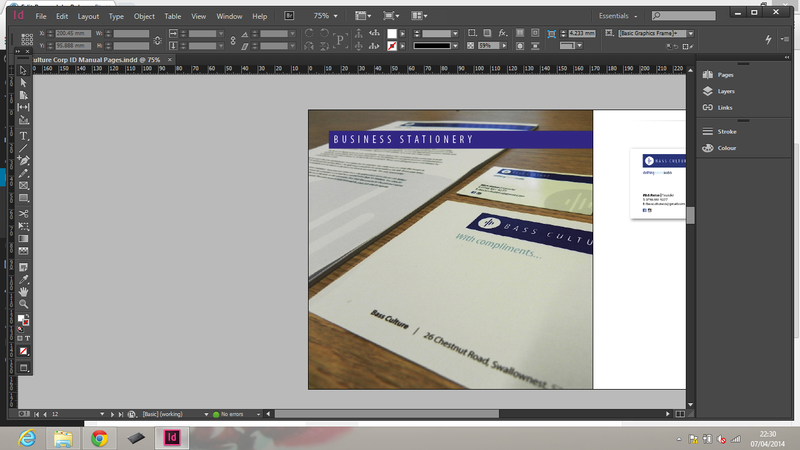 The top idea was just the back of the double sided card I said about earlier which worked on its own. 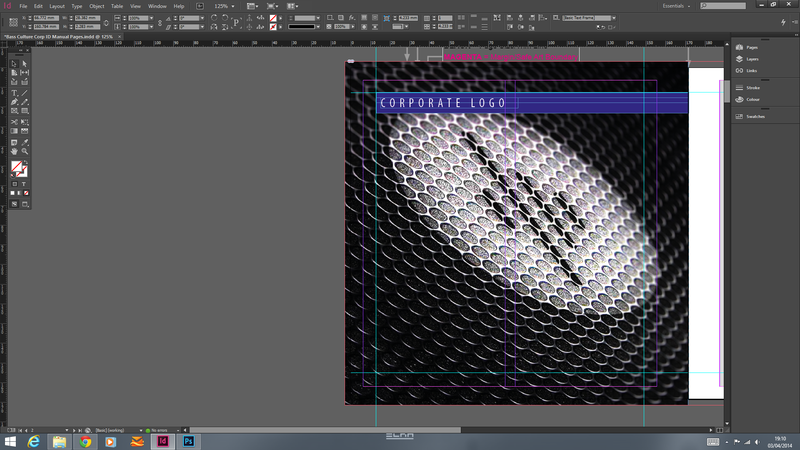 The ‘banner’ aspect I liked quite well so I decided to keep that throughout the designs. Having the text and banner centralized looked good but say if someone else in the business had a card for themselves and had a long name and title, (for instance JAKE PALMER-BLAKE | MARKETING AND DESIGN) then it wouldn’t fit or the box would have to expanded. So then I had a banner coming in from the left going right (because in western culture that is the way we read) which seemed OK but then when I was experimenting with layouts, I liked it when the text aligned with the edge of the banner, but now the text had to be right aligned and preferred it if it was left. Also the logo didn’t look as good with the marque on the right as it did on the left which is why I included the logo variant I mentioned before. 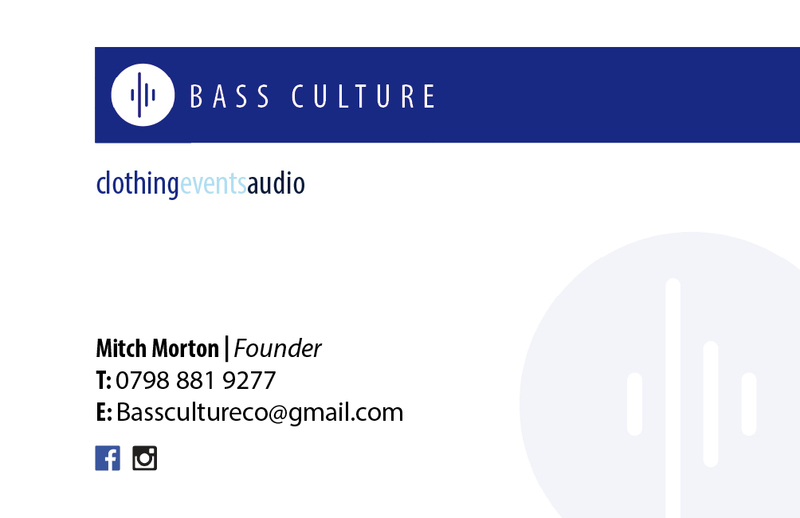 We settled on the second business card idea, but with the design flipped and tweaked (below). 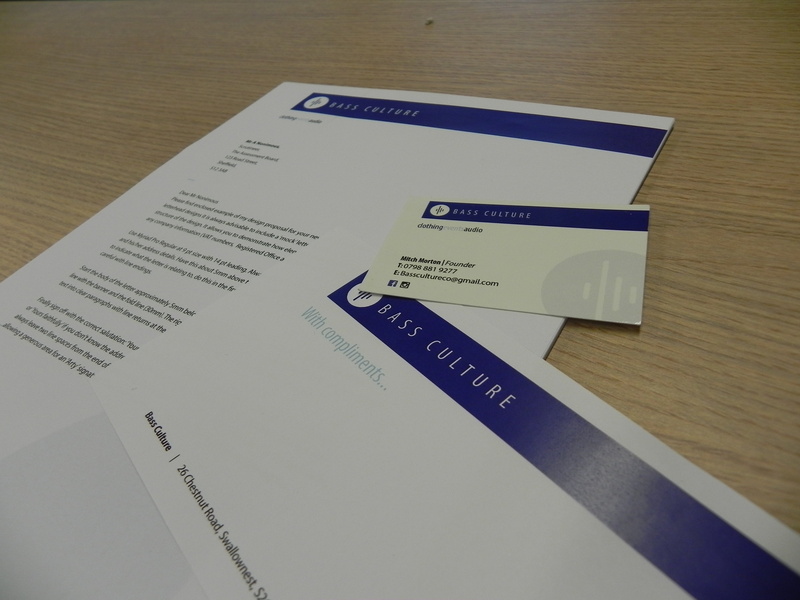 Once I had the business card designed, I had the basis for the rest of the stationary (Letterhead, compliment slip). I wanted to make the stationary as similar to each other as I could. 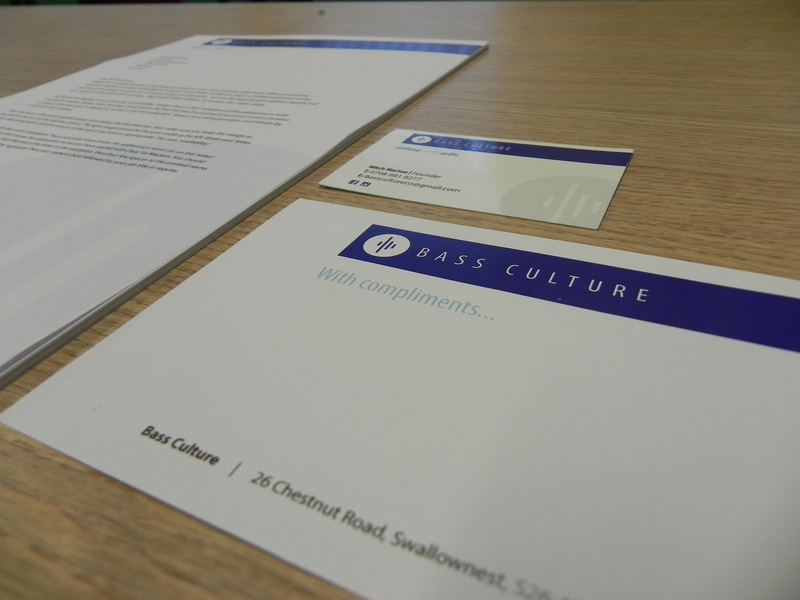 The left design is the banner with a standard letter format (senders address top right and then the recipient address would align with the edge of the banner, like on the business card). The middle and right layouts have the address at the bottom of the page, which came about when I was designing the compliment slip. It worked better at the bottom on the compliment slip to leave more room for writing, so I used that on the letter to keep it consistent. The contact information is centralized, but still aligns with the banner at the top. 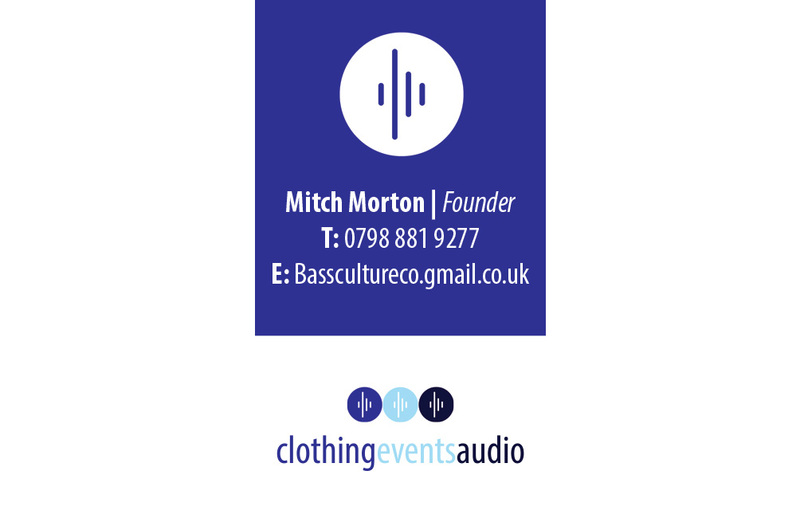 The ‘clothingeventsaudio’ that is on the business card I incorporated into the letter. The middle idea was keeping the proportions between the banner and ‘clothingeventsaudio’ the same as the business card, but it was too big when I printed it out. So I made it smaller (the same size as the text that would be in the letter). 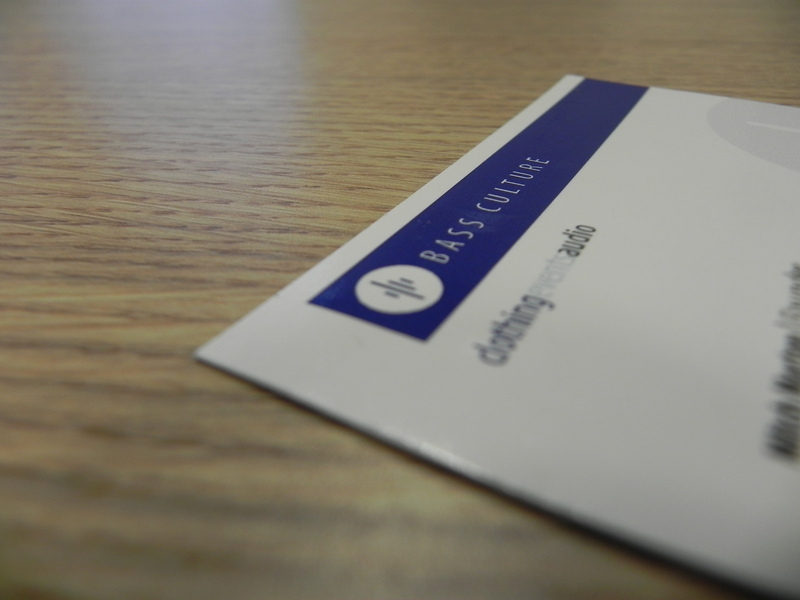 Although this isn’t consistent with the business card and compliments slip, it works and looks better. 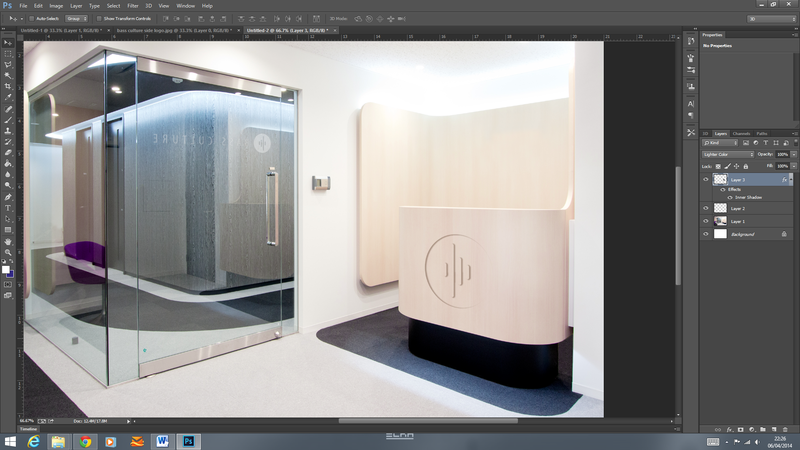 I didn’t include the ‘clothingeventsaudio’ because it would take up more space and I wanted to leave as much space. I replaced with it for ‘With compliments’. It lines up with the logo the same as the tagline on the business card so it’s consistent. I took photos of them for the corporate manual. My favorite was the last one. I messed around with the curves to the colour and contrast looked better. 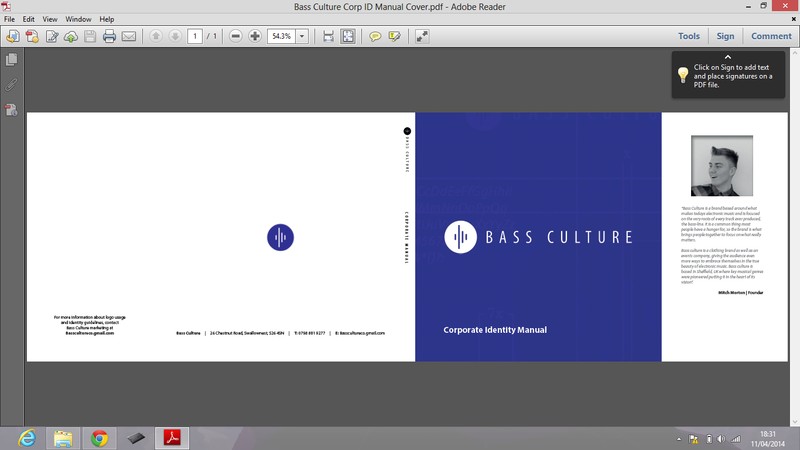 I started work on the manual. 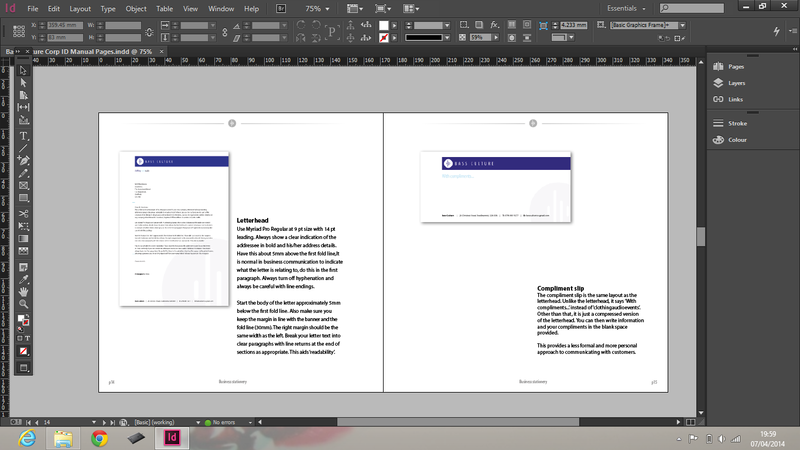 I was getting it professionally printed on Blurb so I used a template plug-in off their website. As the book is quite compact (7x7inch), I chose to do 2 columns on each page. I think this will keep it from looking too cluttered and add structure to the page. I thought just having the footer made the page design look bare, I put the logo at the top of the page, with lines coming off the side. I tried it with a gradient which I thought looked better. 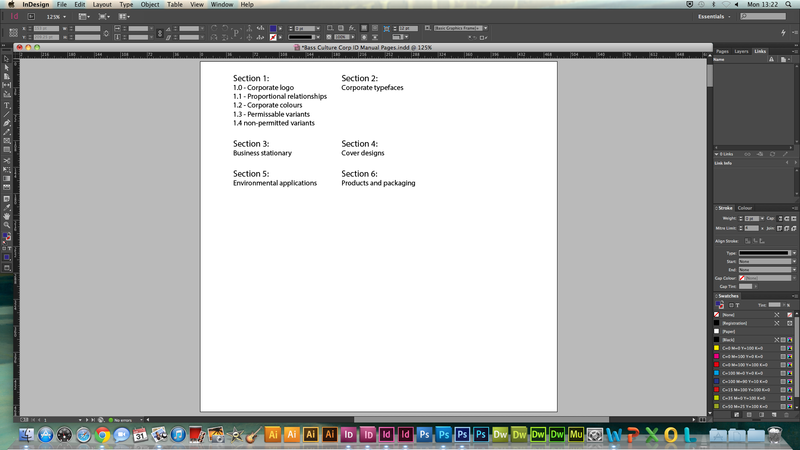 I tried a few different ideas for the section dividers. I knew that I wanted them, but I thought about what they could be. 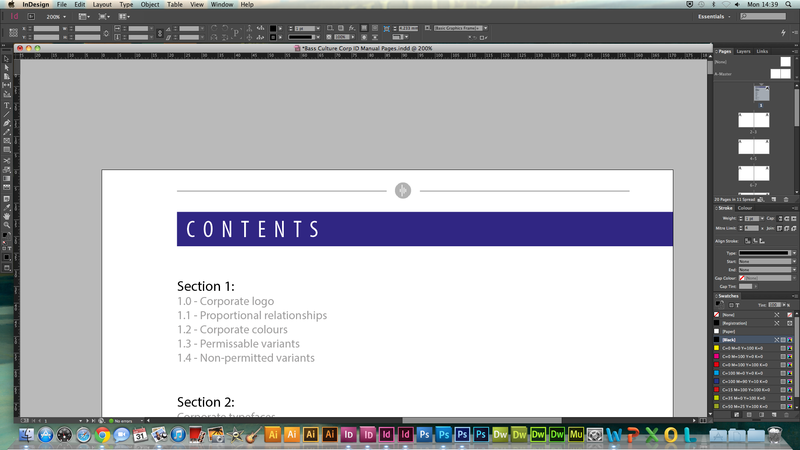 I thought about just a banner to keep it consistent with the contents page. 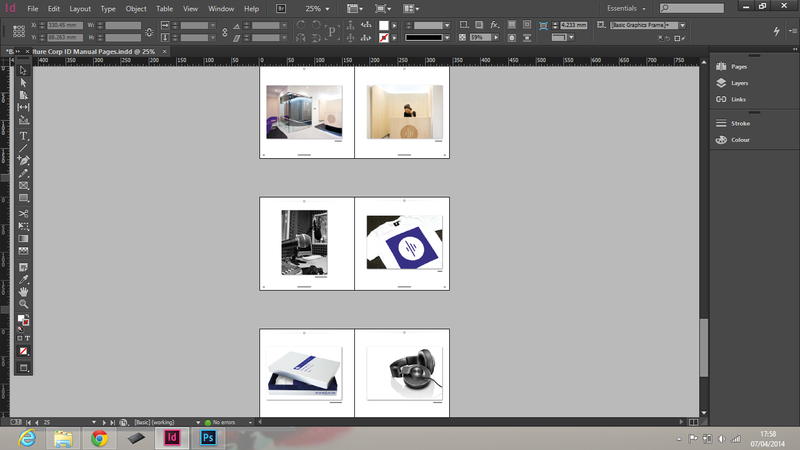 Also having images taking up a full page. 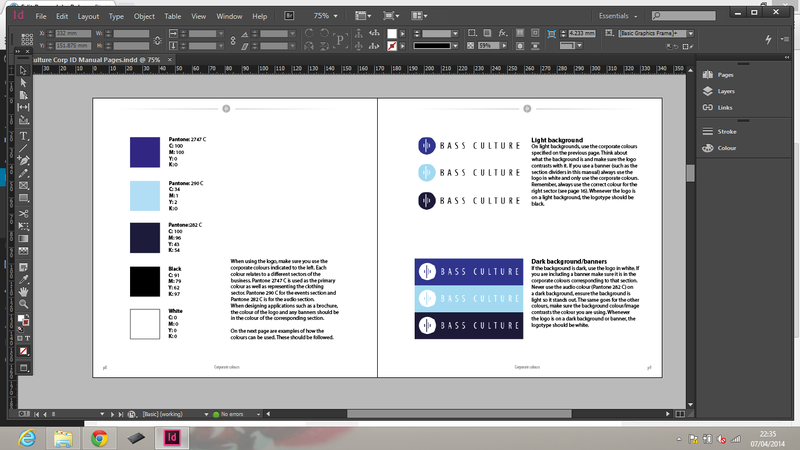 I tried just having the logo taking up the full page, but I didn’t really like it, same for just the symbol. 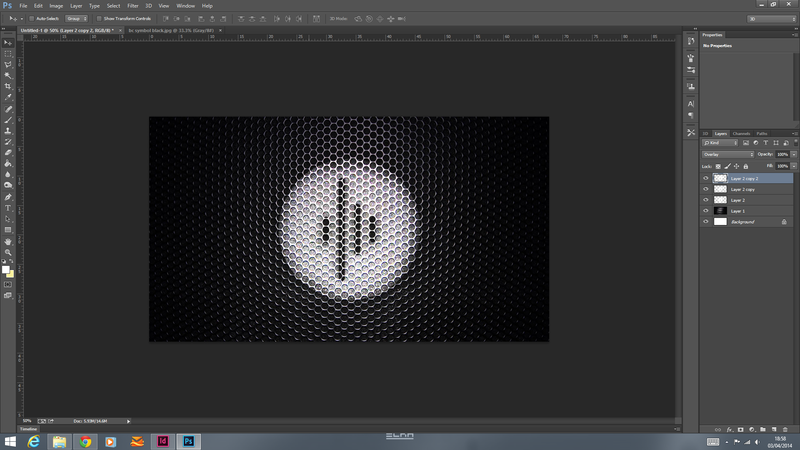 I decided on having an image of the logo on a speaker or something. A t-shirt would have worked but I wanted a t-shirt for the applications page so I used a speaker, which was also relevant. I knew I would have super impose it onto a speaker which was easy enough. I didn’t want to use something like Pixeden where it automatically does it because this one was simple to do. I first found an image that I could use and placed the symbol on top of that. 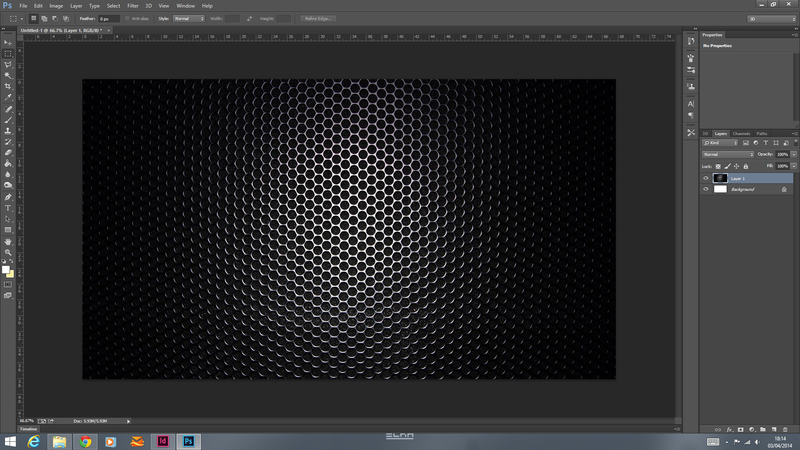 I then changed it to Overlay and duplicated the layer to make it more prominent. I slightly erased around the edges to make it look more like a stencil was used, also to blend it. I then used distort and perspective to make it look like it was taken at a artistic angle. 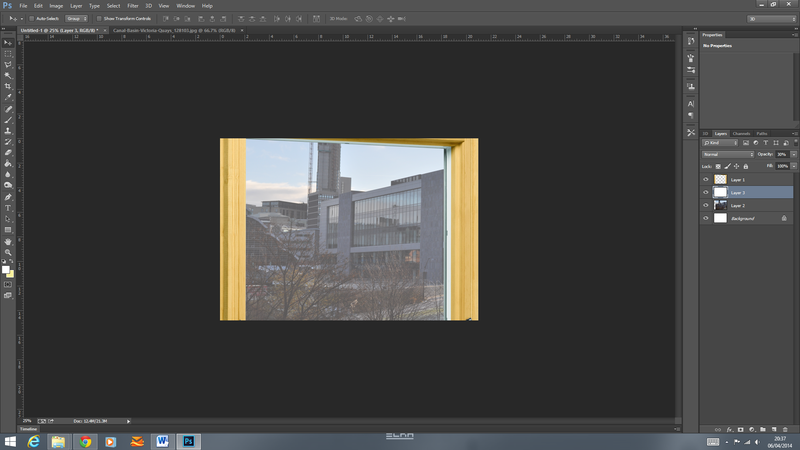 I then found out how to give it depth of field (Iris blur) to make it look more like a realistic photograph. 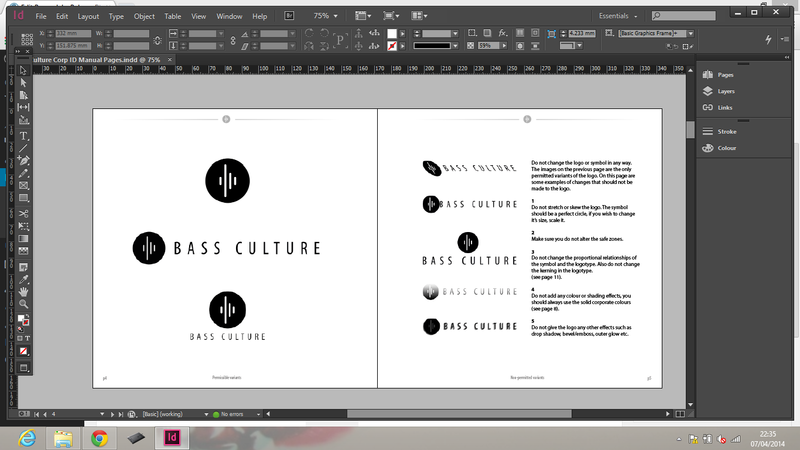 I put it into the manual and used the master page to put the banner on the page. 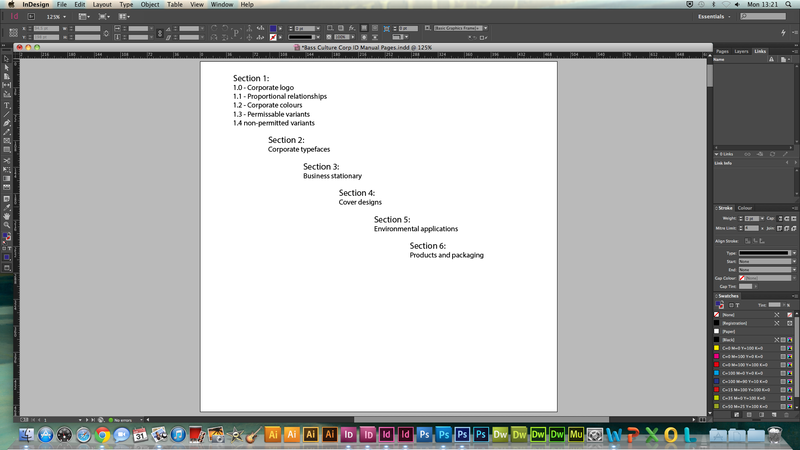 Because I was now using images/photographs as section dividers, I struggled on what to use for the typeface section. I didn’t want to use just type or obvious like a pen or keyboard. I thought about using a photo of a computer screen with the Myriad Pro typeface on it, but It didn’t look very good or then seem a good idea once I saw it. 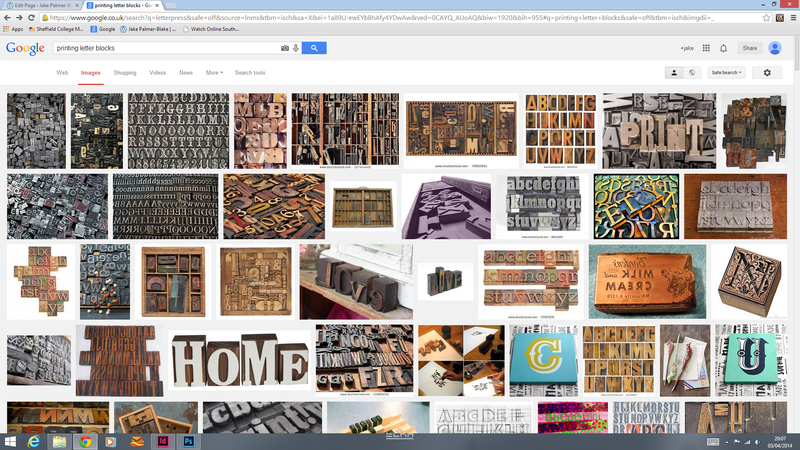 I then thought of the idea of using the letter blocks from a printing press. I found an image that I liked and put it in the manual. 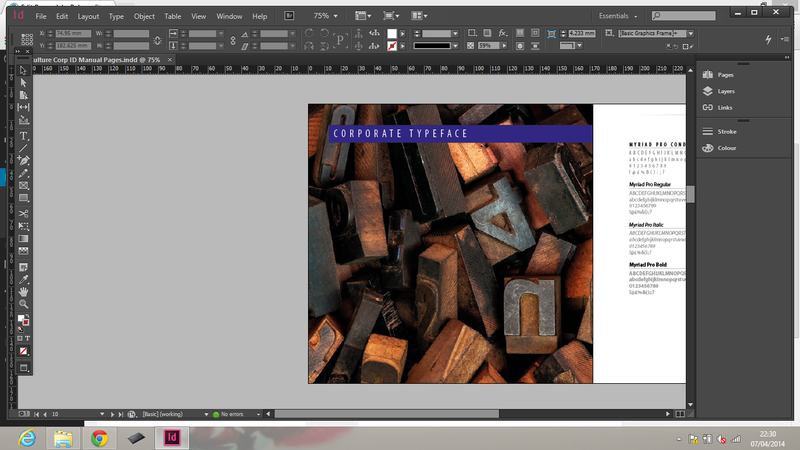 I changed my mind on the image because the type blocks were a completely different style of type than the font I used. I changed it to a better image with a similar sans-serif font. 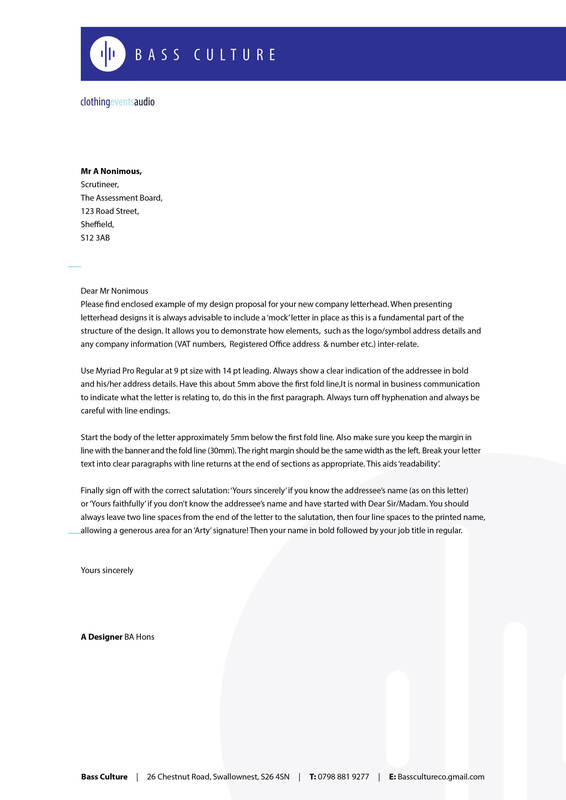 I put the image of the letterhead that I talked about before into the document but it didn’t look good because the size off the page meant it cut the text out and did’tn look as good as the original image. 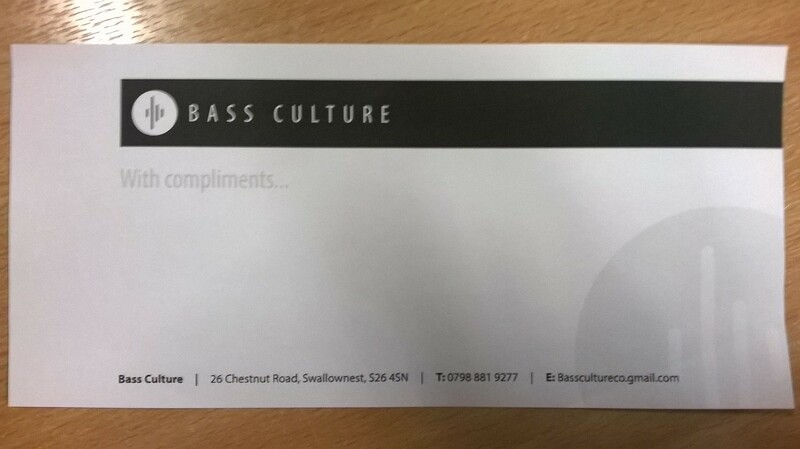 I used a different image of the letter, business card and compliment slip. I thought this image worked better. 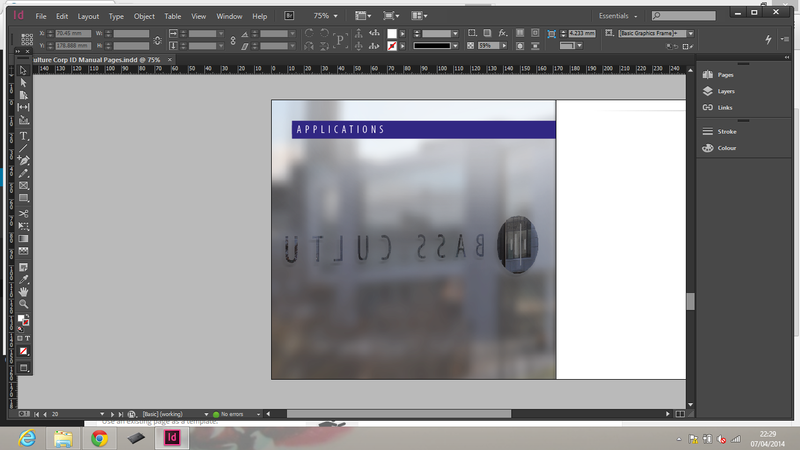 I made my own image for the applications section. 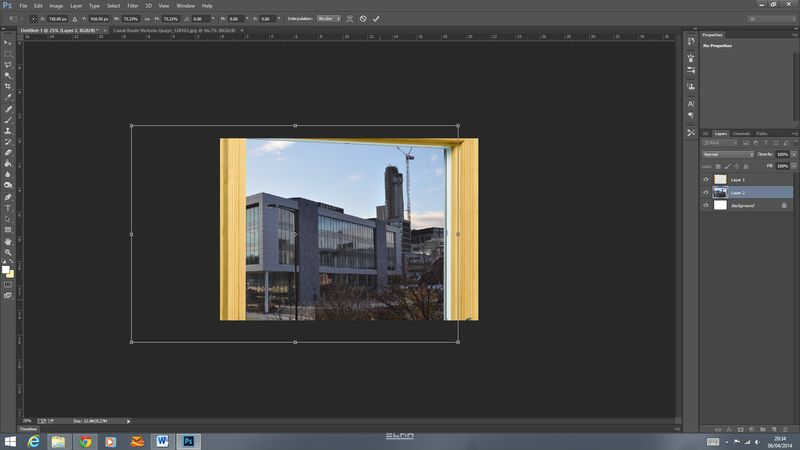 I started off by getting an image off a window frame, and a good image of a part of Sheffield being that the company is based in Sheffield. 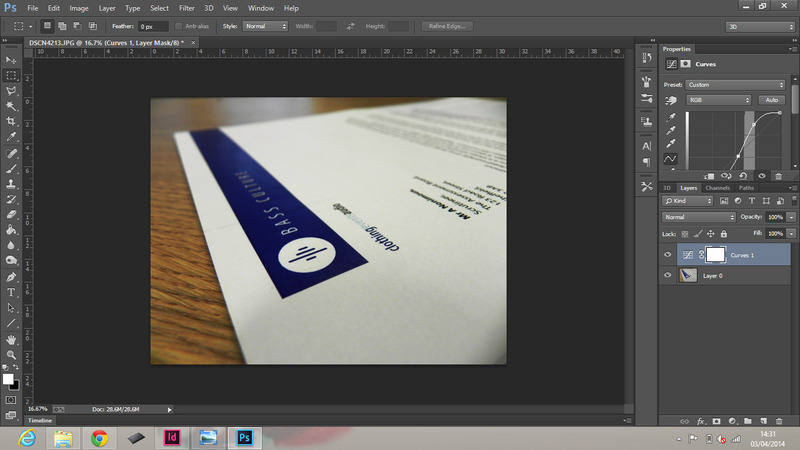 I blurred the image which will add to the frosted look. I made a new layer which was white and lowered the opacity. This was going to make a frosted glass effect. 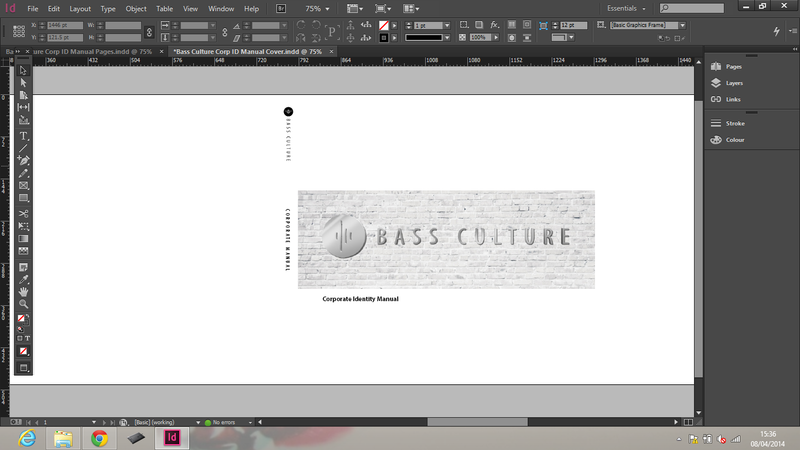 I then placed the logo into the document. I reversed it so it looked as though you were looking out of the window, so the logo was the right way when looking in. 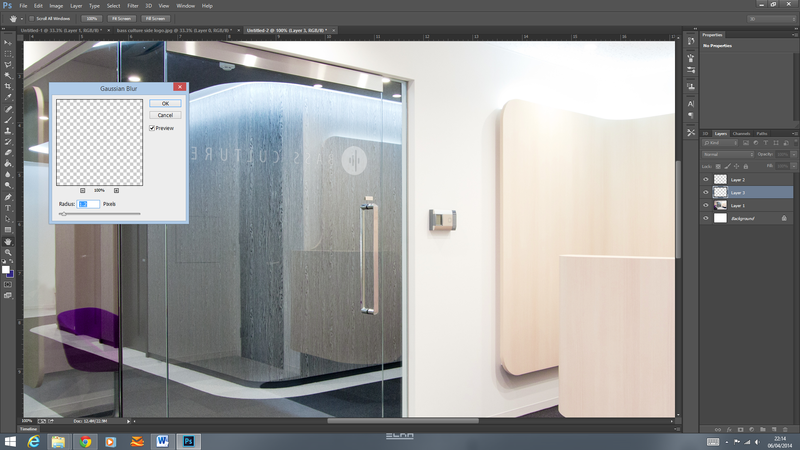 I selected it and deleted the selection from the white layer and the blurred background layer. This made it look as though the the logo is not frosted, and the rest of the window is. 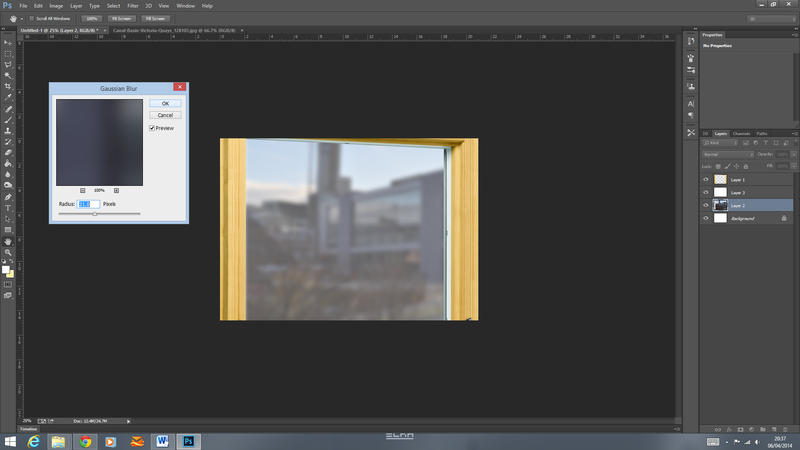 I used a brush tool with lowered opacity to add lighting effect to the window. 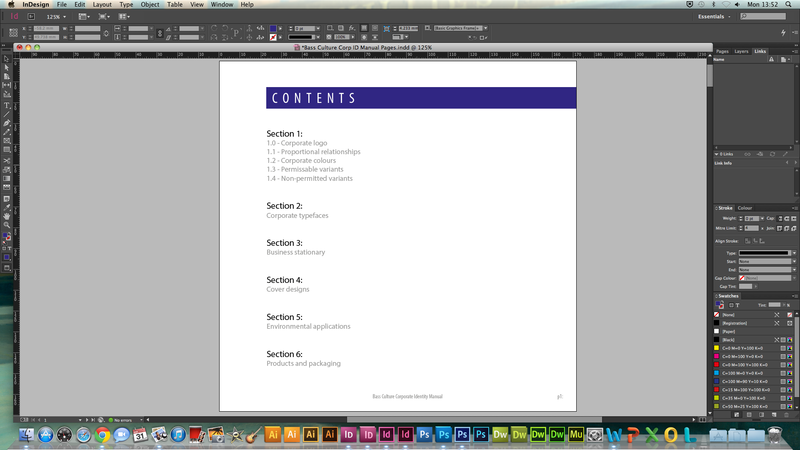 Once I had the page numbers figured out and the section dividers were done, I started adding the bulk of the content. Because the content on each page varied from one another, and the document being compact, it was fairly harder than anticipated to keep it as consistent as possible. I tried different layouts such as the text above the images, the images above the text and the text always in the same corner. I settled on having the text always in the bottom right corner of the page and the images working around it. 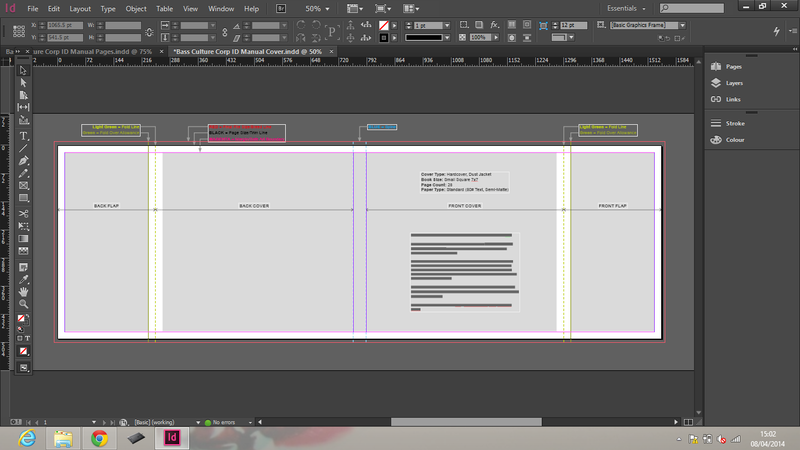 Although the pages varied, this layout kept some consistency to the booklet. 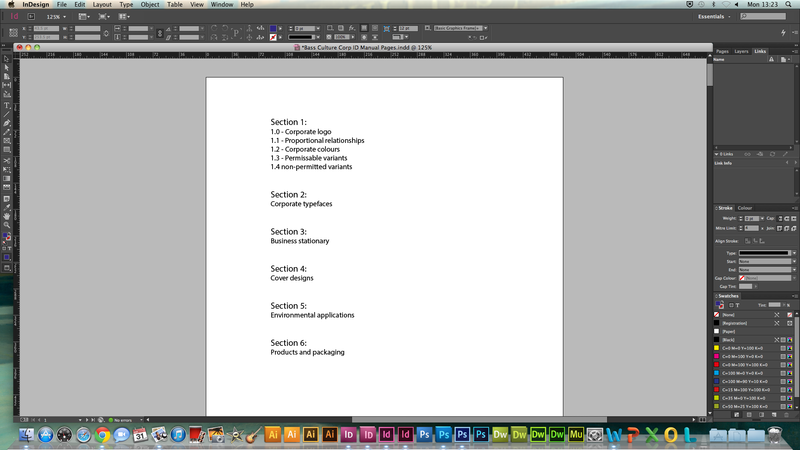 I started the super imposing process for the application section of the manual. Because I am doing it for a real business, I didn’t want to go over the top, I want to be as realistic as possible. The reception images took some time to find, because the business is small at the moment so I didn’t need a big fancy reception in a huge office etc. 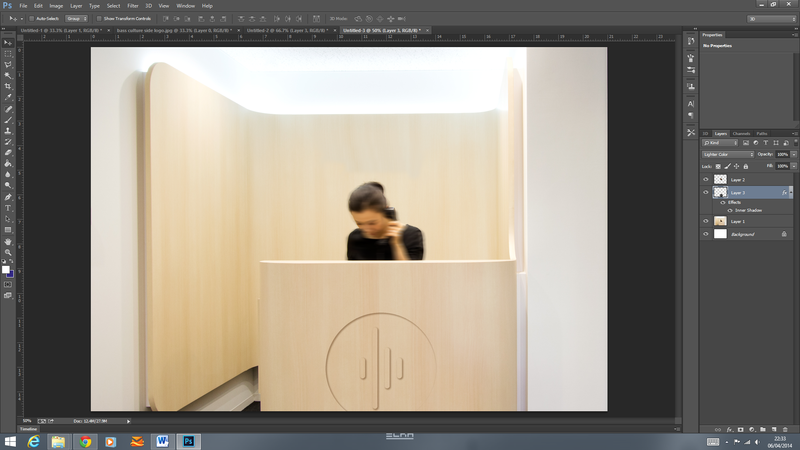 so I found this image of a small and modern looking reception, which would be a realistic reception if the business ever got an office (which they don’t have at the moment. 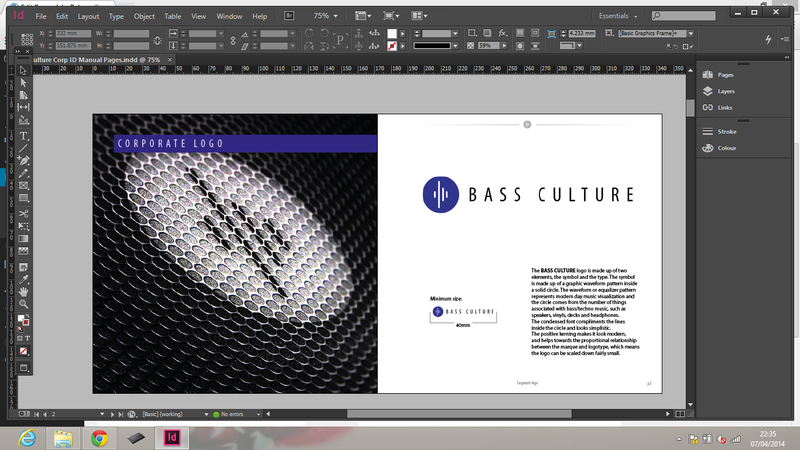 I got to work adding touches to make it look like the actual Bass Culture head office. I started by changing the colour of the chairs, just a subtle touch, but making them blue helps it stick to the colour scheme and makes it more believable. I used selective colour to do this. I added the logo to the door of the office. 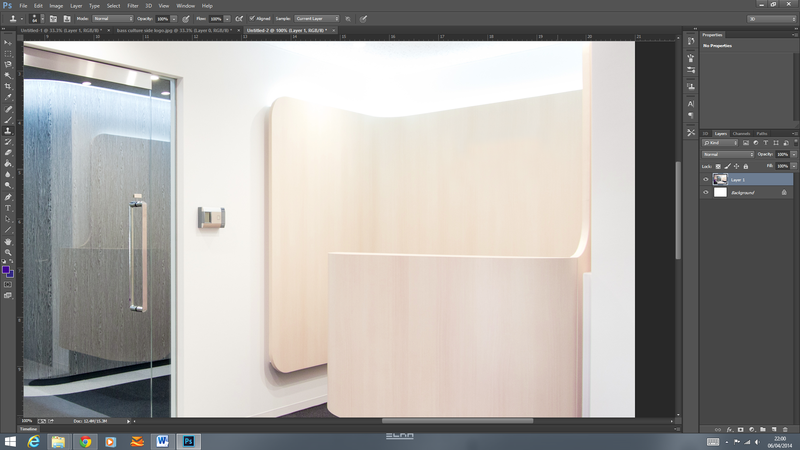 I placed the logo in, flipped it and did the same thing as I did to the frosted window for the section divider. I used vanishing point to get the perspective right. The final change I made was the logo embossed into the desk. To make it look as though the logo was carved out of the wood, I again used vanishing point to get the perspective right. Changed the layer to overlay so the texture came through then used an inner shadow to make it look 3D. I tried using the symbol which looked better than the full logo. There was another photo of the reception at a different angle, with just the desk, which I used as well. I thought of other applications I could use. 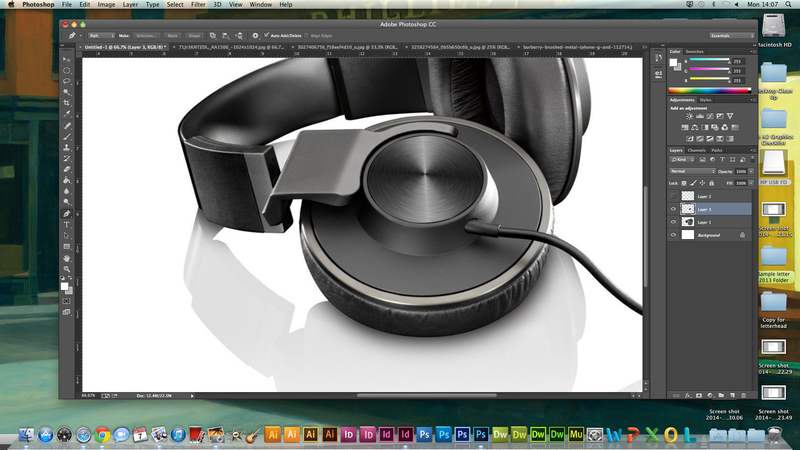 I decided on the recording studio, A T-shirt, T-shirt packaging and headphones. I started with headphones. 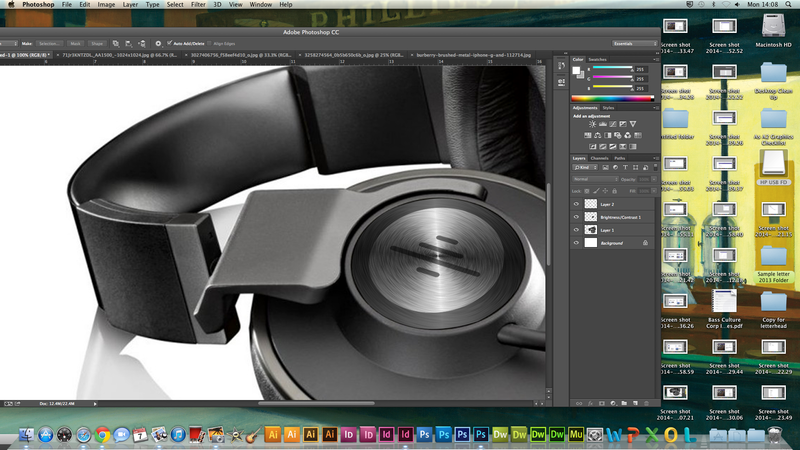 I found an image of some generic looking headphones (unlike beats or skullcandy etc.). These particular ones had brushed metal which was a texture I liked. To get the logo onto it. I changed the layer to overlay so the texture came through and looked more realistic. I then used distort and perspective to get the symbol at the right angle to make it look believable. I tried using vanishing point but it didn’t look as good when I did it ‘free hand’. For the other applications I pretty much used the same techniques for them so I won’t put up all the screenshots. For the T-shirt, it took some time to find a good image (because I set the search filter to large and labeled for re-use and modification). I used the stamp tool to camouflage the image that was already so it looked like a plain white T-shirt (which was surprisingly hard to find a good image of). I again used the warp tool to make it work with the folds of the shirt. 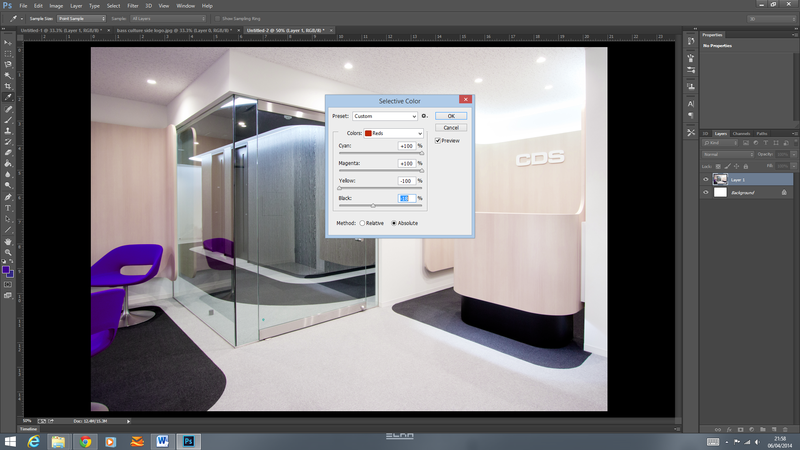 For the recording studio, I again used the same effect of frosted glass on the mirror at the back of the image. Once I had finished them, I placed them into the manual. There wasn’t much to write about applications in this section, so I just wrote a small paragraph at the beginning and put one image on each page. 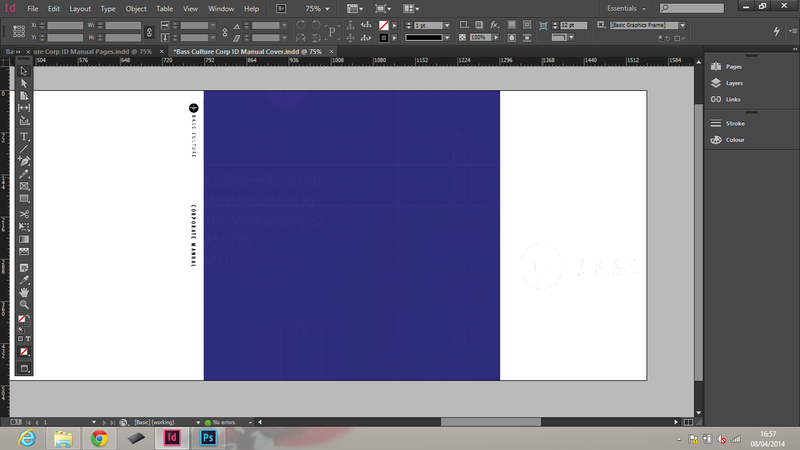 I started on the cover. 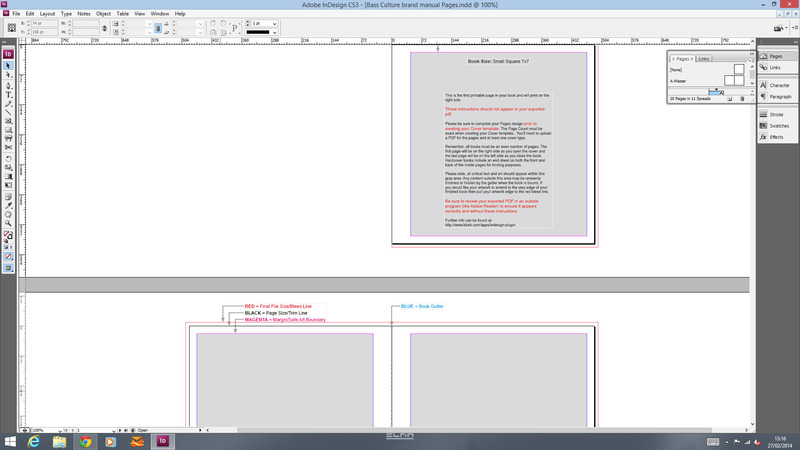 Because I used a Blurb template, I had to complete the content pages before the cover because the number of pages determine the size of the cover. I didn’t want to have just the logo on the front page, so I tried the logo on a wall, like I used in the manual (application section). Although it looked alright, I thought I would try other ideas. One that I liked was having a faint like blueprint design in the background, with the proportional relationship lines and things. I stuck with the same colour for the background. 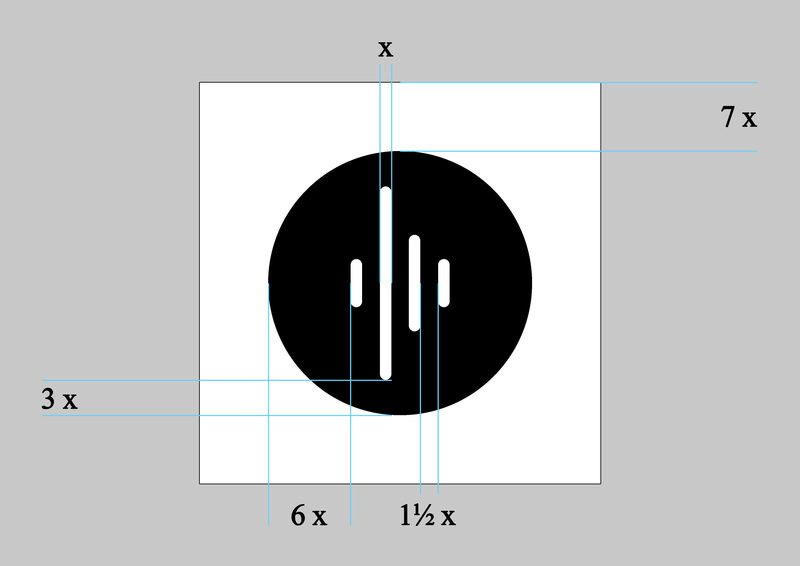 I made the grid just using lines than I put the symbol, corporate typeface, x’s and y’s etc onto it. I made all the aspects of the cover more subtle because I thought it looked better as a faint background that the logo and ‘corporate identity manual’ would go above. Once I had the cover figured out. I placed the logo and text onto the front cover. I tried using the banner like on the stationery, but it didn’t look good. In the end, I just centered the logo and the text down in the bottom left. 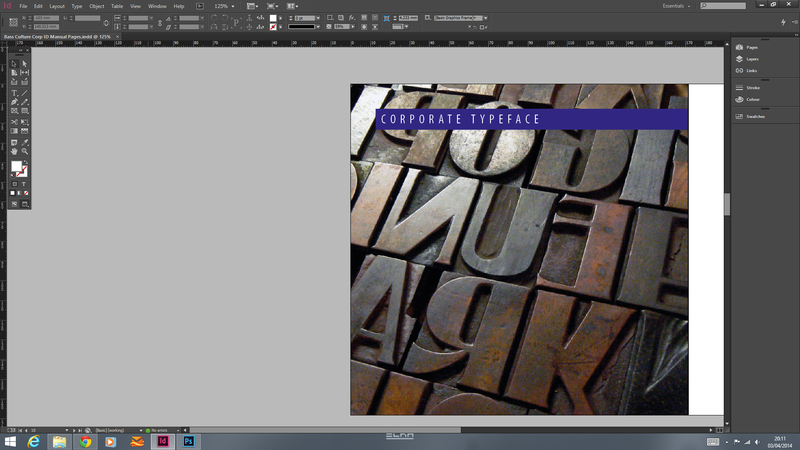 Like the business stationery, I aligned text with the logo. I didn’t want to cram the cover wit too much content, that’s why I made the background faint. The back cover, was simple as I just put the logo in the middle. I didn’t need to put anything on it, but I thought it looked good. 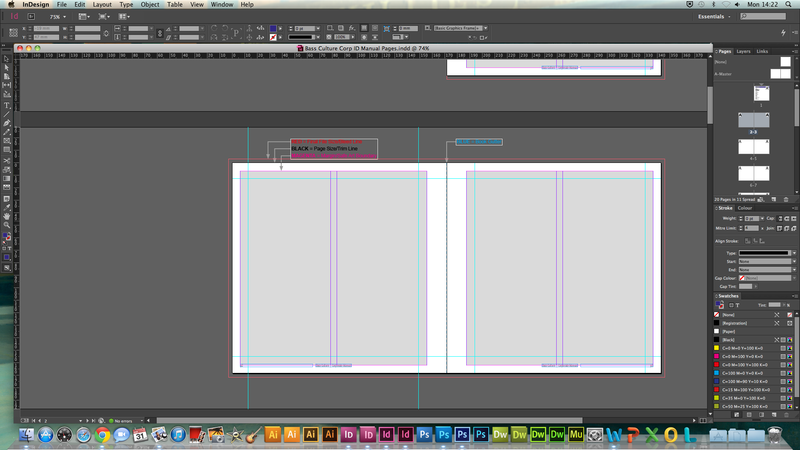 As I chose to have a dust cover, I had to design the front and back fold flaps as well. Like the back cover, I didn’t need to put much, if anything on it, but I wanted too. On the back flap I just put the marketing contact info if you have any questions etc. about the logo, manual etc. 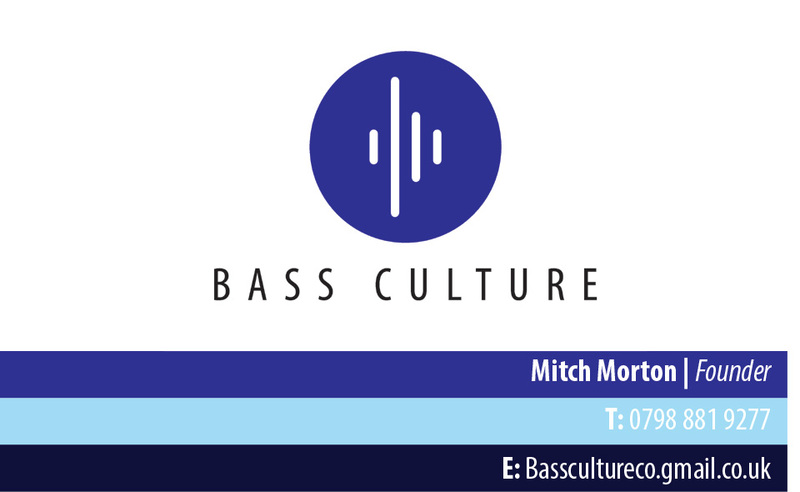 On the front flap, i wanted to have a short intro to the company, so I got Mitch to write something explaining the company. I used his picture as well to make it look more personal. I think it was a good idea to do this project for a real business as opposed to a fictional one. 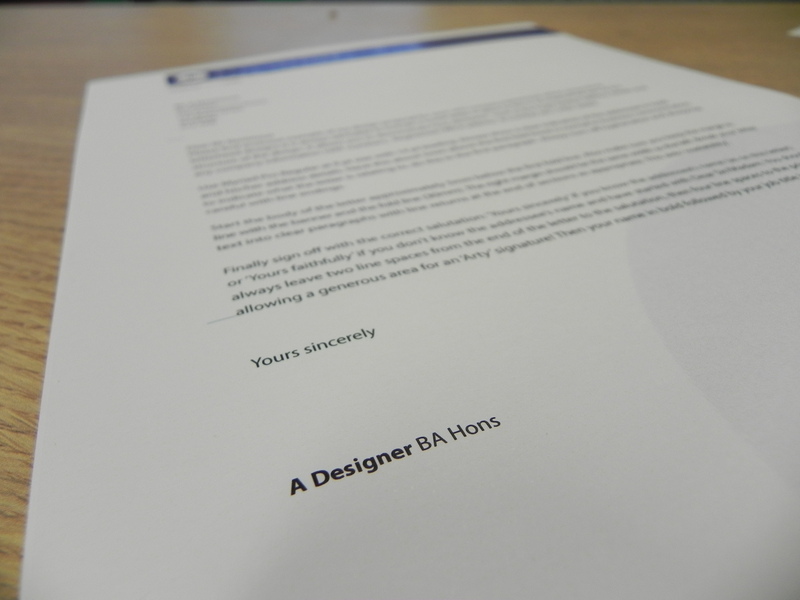 It gave me some experience working with another person who isn’t necessarily a designer and how they view design work. I was a bit weird in some places though, where usually I would come up with a design, then sticking to it, rather than designing something and having to ask if they like it and explaining why certain things are the way they are etc. 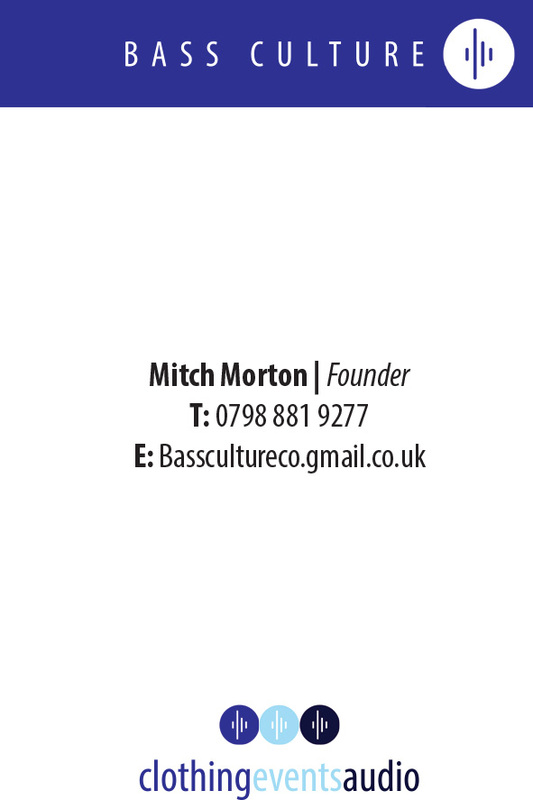 Overall I think the logo and designs suit the business well and Mitch was happy with them which was the main thing. I did get this professionally printed as well, unlike other projects when I have just used the print room at the college which was a new experience. The layout of the manual took more time than expected to sort out, because of the budget, I ordered the small 7×7 inch booklet, which is more compact than the other options. I think I have also developed my superimposing skills for the application section, as it has been a while since I have done similar work.